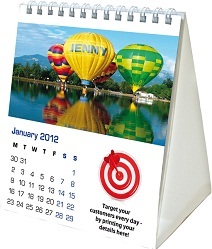 Promote your company brand name and logo with a personalised Branded Desk Calendar!!! on a daily basis, all year round!! The word calendar derives from the latin word 'Kalendae' - meaning the first day every month. Paper or electronic, calendars have taken the place of traditionally organising events and planning, but sequentially placing 'dates' rather than 'days' and allowing a day, week, month and full year overview of the selected dates you desire to view. Many civilisations used calendars to their own uses, and have them suited specifically - that are usually in sync with our moon, and our sun (sol). With our promotional calendar we can provide a quality 13 leaf print, 135x150 custom and personalised business calendar for your needs - totally perfect to hand out as business conferences, meetings and trade fairs as a freebie or company gift. * Print: 13 leaf printed - one sided.